If you've never heard of soap nuts, you're in for a treat. Soap nuts are actually berries that contain saponin, a natural agent that works as a cleanser. They are particularly popular for making homemade laundry detergent as it breaks the surface and penetrates the fibers of clothing causing it to lift stains from the fabric. Unlike conventional detergents that have artificial and often toxic foaming agents, soap nuts do not produce a lot of foam. But in reality, foam is not an indicator of the soap's cleaning power and rest assured, soap nuts are actually a better choice for cleaning products. Feel confident using soap nuts to wash your clothes….or your hair. 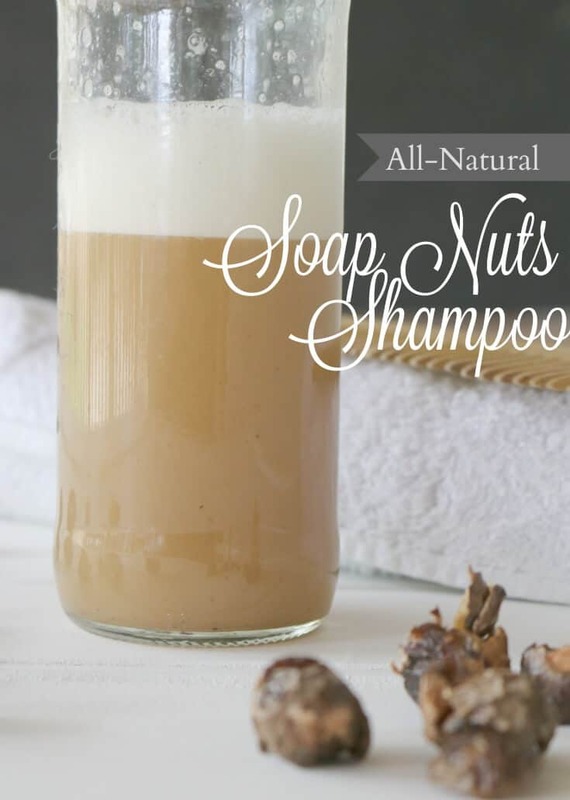 That's right – soap nuts are also a great alternative to commercial shampoo. I view this as a stepping stone before going completely no poo (washing hair with a gentle alternative to shampoo such as baking soda and apple cider vinegar). THIS post has some basic ‘No Poo' information for beginners. But my personal preference is to actually alternate every few weeks between this soap nuts shampoo, no poo, and basic castile shampoo. I've found using this method, my hair preserves it's natural oils better without that greasy look and feel. However, be warned that anything truly natural requires some detox action first. Just like with food, when you initially eliminate junk food from your diet, your body may experience detox symptoms such as skin breakouts, bloating, constipation/diarrhea, headaches, and fatigue. Same is true with skin and hair. When you switch over from commercial products filled with parabens and sulfates, you need to give your body time to adjust to these clean products. You may experience sticky, matted, dry or brittle, or extremely greasy hair during detox process which can last anywhere from 2 weeks to 2 months, depending on how often you shampoo and how much hair products you have been using. 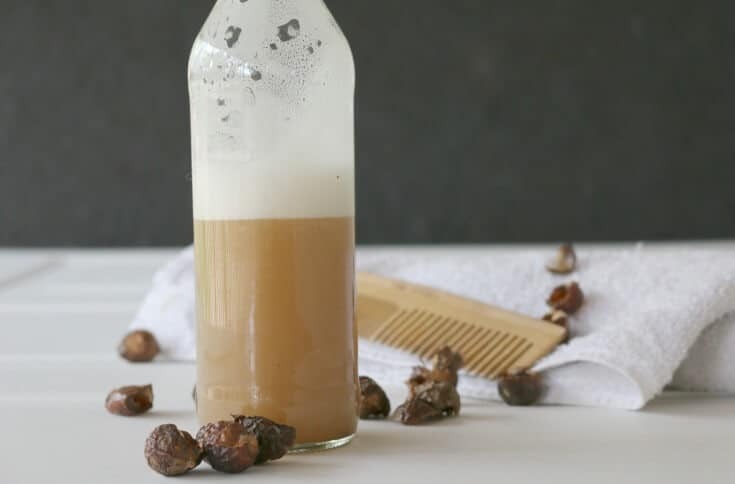 I have been enjoying my homemade collection of hair products, including THIS DIY nourishing hairspray and my locks have now completely adjusted to a completely natural hair care regimen. It's worthwhile mentioning that I have long hair and this process still works well for me. You don't have to have a pixie cut to use natural shampoo but I do suggest to experiment and find what works best for your hair. I personally found that I should not wash my hair more often than 3 days, otherwise it becomes heavy and greasy. Also, a quick vinegar rinse as a conditioner can work wonders. Finally, doing a wet comb through takes care of all the tangles for my long hair. I usually air dry my hair on most days, expect when I want volume (which is really every day) – on those days I'll blow dry my hair for some extra oomph. Place soap nut berries in a pot with 2 cups of water. Bring to a boil on medium-high heat, then reduce heat to medium and simmer for 15 minutes. Set aside for a few hours to completely cool or overnight is best. Pour the soap nut mixture into a blender, add sweet almond oil, if using and give 3 pulses to break up the soap nuts even further. It will foam but using the pulse option instead of blend, you're minimizing the suds. Strain into a bottle (a peri-bottle works great for this) over a strainer to catch all the soap nuts pieces. Makes about 1 1/2 cups of shampoo – enough for 6-10 uses, depending on length and thickness of hair. Directions: Pour about 2-3 tablespoons directly onto hair and massage well. Rinse hair under running water. You may follow with a vinegar rinse for conditioning but not necessary. Most recommend lathering hair and leaving the shampoo for 5-10 minutes before washing it off, but I've found that unnecessary. Still, it's something to be mindful of when you're experimenting with your hair. Take care not to get soap nuts shampoo in your eyes. It will burn. Be extra vigilant when using this on children. Because soap nuts are actually a berry fruit they are not nuts at all so they are completely nut allergy safe and have been used successfully with no reactions by people with nut allergies. As mentioned above, I alternate this shampoo with no poo and sometimes castile shampoo – do what works best for your hair. This is so cool!! It’s been a year since we’ve used “normal” shampoo so I love trying new recipes! I usually shampoo by hair with a mixture of castille soap and coconut milk but this sounds like a great alternative. I pinned and shared it!! I’ve never tried soap nuts before. I love making my own laundry soap, though! 🙂 Thanks so much for sharing this with us at Allergy Free Thursdays! I’ve never even heard of using soap nuts for your hair before! I’ve pinned this and will definitely be giving it a try. Currently, we use homemade shampoo bars, but this may be a bit easier for us, no curing! Thanks for sharing with us at the homestead blog hop, hope to see you again this week! This sounds wonderful! thanks for linking up with lets get real! I’m so excited to try this recipe out! My husband isn’t quite ready for No ‘Poo, so this would be a great alternative! That is awesome! Do you LOVE living in Fiji?